I hope everyone had a wonderful Thanksgiving. Ours was pretty low key, but I enjoyed trying a few Pinterest recipes off my 'food' board and I'll share some of the highlights with you shortly. I also made a decent amount of progress on the bathroom tiling. I had the glass company come out and measure for my frameless door (you can have them measure as soon as the tile is set, you don't need to have grouted or sealed it.) I did take quite a few days off from working on the remodel since I was pretty busy with the holidays and I was burning out. To say 'I am sick of tiling' is an understatement. I also finally finished up the bathtub surround. 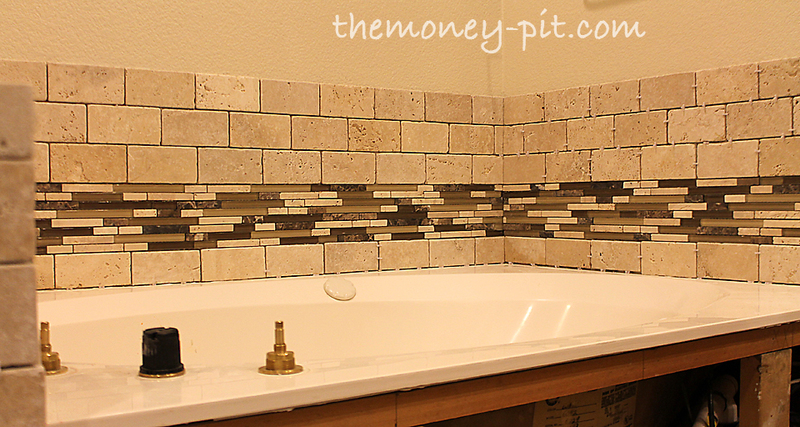 Again I continued with the same tumbled travertine from the shower, with an accent stripe of pencil tile. 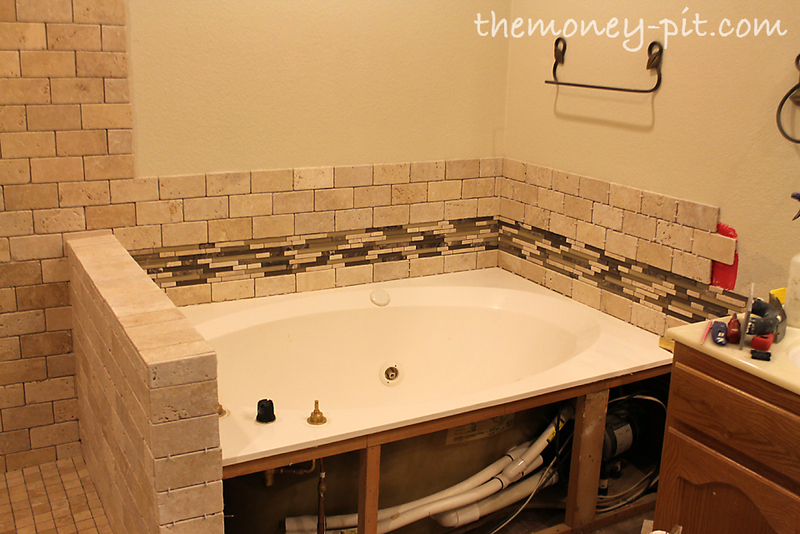 You can see I still have to put a new front on the roman tub as well as tile the wall next to the vanity. I am holding off on that final tiling because I am getting new countertops and I will need to cut the tile out around them. It is looking pretty good. My vision is coming together. I now need to consider what I want for a new wall color, but I need to also consider the new vanity and countertop colors.. decisions decisions. I'm so happy I stumbled upon your blog a few weeks ago. You are about 3 months ahead of me on the shower overhaul, so I am thankful you have such clear insight into what I'm getting myself into! I do have a question, is there a reason you went with the painted on waterproofing system versus something like the Schluter shower kits? You're very inspiring, keep up the good work! Looking great, Kim!! Kudos to you. We are thinking of redoing our bathroom, but we just don't have the mojo or skills to DIY it. You rock! No real reason other than I wanted to use supplies I could find at Home Depot. I didn't want to special order anything. I also wanted my shower to be a custom size (to fit in the niche that was there) and I didn't want to deal with a standard sized drain pan etc. That being said, I have heard nothing but wonderful things about both the Schluter, Ditra and Kerdi waterproofing systems. If they sold them at a big box store I would have been all over them! Oh Wow, Kim! It looks fabulous! 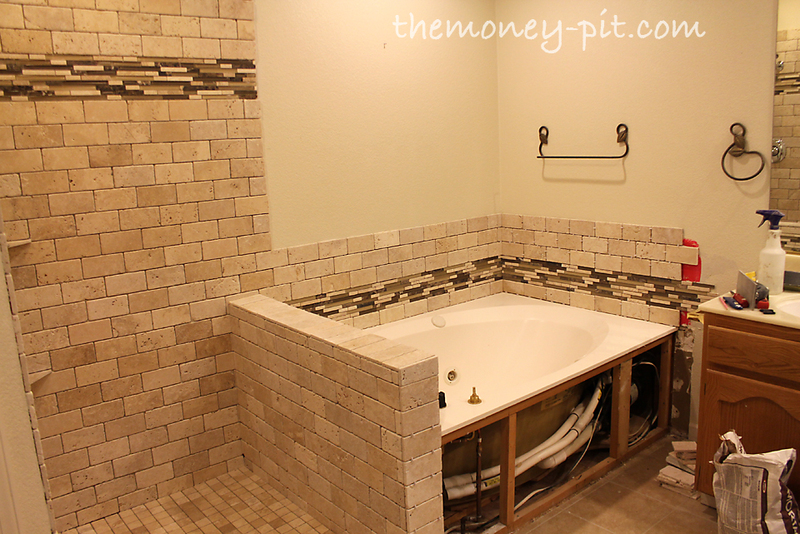 The tiling took the bath to a whole new level! Love the choices you have taken! We are currently in the stages of remodeling our shower and I came across your blog. 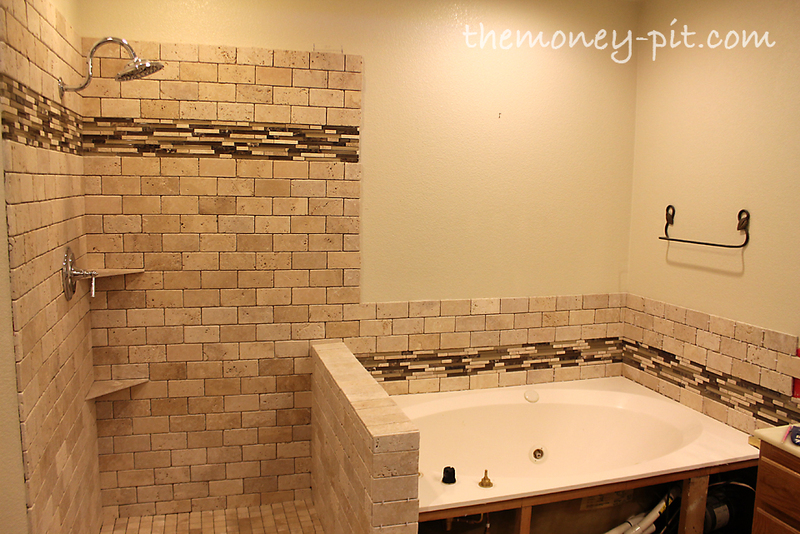 Your shower/garden tub layout is identical to ours and I just loved how you integrated the tub with the shower. I read all of your remodeling blogs, but could not find anything on how you remodeled the front panel of the garden tub. Currently, our front faux marble panel is flush with the edge of the tub. From what I can tell, there is no sheet rock behind the panel, which would leave me with about 1/4 inch of depth to install a backing and tile. 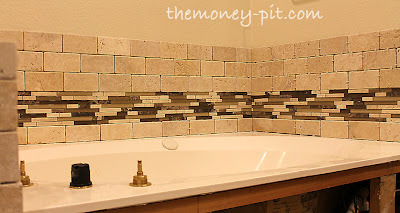 I'm afraid the tile would then protrude and not have the recessed look that you have achieved on your tub. I guess my question is, was there sheet rock behind your front panel and also, what type of backing did you use to glue the tile to? Thanks in advance for your input on this!